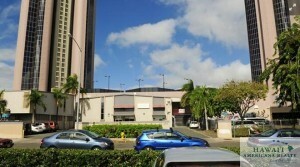 Hughes ANAHA at 1108 Auahi St.
A bill to “reboot” the Hawaii Community Development Authority, the state agency charged with overseeing the redevelopment of Kakaako, seen here in this file photo, has been sent to Gov. Neil Abercrombie for his signature. Hawaii regulators unveiled an update Wednesday for the Honolulu neighborhood of Kakaako’s transit-oriented development plan calling for diverse residential building types, ground-oriented family housing near transit stations, additional reserved housing, grocery stores, cultural and community amenities, food trucks and spaces for artists. Deepak Neupane, director of planning and development for the Hawaii Community Development Authority, the state agency regulating development in Kakaako, presented the plan to the HCDA board at a workshop meeting at its offices in Honolulu. The plan also includes the adaptive reuse of historic buildings and the efficient use of off-street parking. There would be more green buildings, green roofs and walls, as well as slender, sustainable residential towers. Other elements include creating a well-connected pedestrian network, a complete network of bicycle lanes and establishing a Transportation Management Association. In November, Gov. 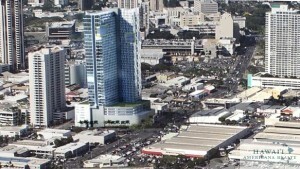 David Ige gave his stamp of approval to the final environmental impact statement for the area’s TOD plan, which incorporates urban design, mobility and access, complete streets, rail transit, and parking and transportation demand-management principles to create a compact, walkable and livable community in Kakaako. The 300-page plan, which covers about 600 acres, now heads to the plan and rule adoption phase. Neupane said there will be workshops and public hearings, among other steps, before a final update is drafted. 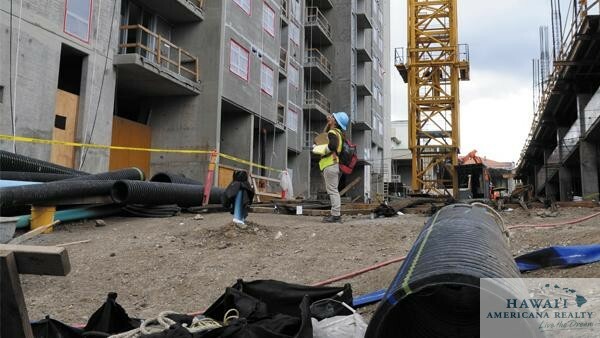 The 801 South St. project in Kakaako is one of the workforce housing projects in the area. The Hawaii Community Development Authority has given the developer of a Kakaako condominium a waiver regarding a glass rule issue. The state agency regulating development in the Honolulu neighborhood on Wednesday unanimously approved Downtown Capital LLC’s petition for a waiver to the rule, and deleted a section of the developer’s development permit for its 801 South St. “Tower A” workforce condo. However, the decision does not suspend the glass rule for the area as a whole. Ryan Harada, a principal with Downtown Capital, said that it is pleased with the decision by the HCDA and it appreciates the work done by the staff that posed no disruption to the residents of the completed condo tower. The issue dealt with the window glazing at he 801 South St.’s first condo tower. In August, Downtown Capital filed a petition for a waiver or suspension of the area’s glass rule as it pertains to the 801 South St. project, and to amend its development permit. The developer also asked that the waiver or permanent suspension of the rule become effective Dec. 5, 2012. 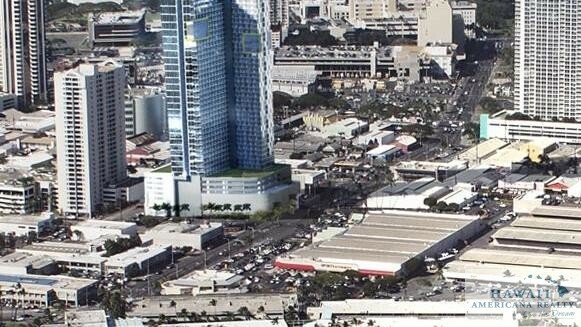 Shortly after receiving Downtown Capital’s petition, the state agency, which regulates development in Kakaako, issued a notice of violation to the developer regarding the glass rule. The glass rule says that window glazing shall be transparent with clear or limited UV tint so as to provide views out of and into the building, and that the visible light transmission level of windows on the ground floor shall be 70 percent or greater. The HCDA said that, based on the report done by its consultant on this issue, Douglas Engineering Pacific Inc., it believes that there are several glazing products that could have been used in the project that would have met the requirements of the glass rule. Together, the two towers are expected to have a total of more than 1,000 units. In September, the HCDA let San Diego-based developer OliverMcMillan proceed with its Symphony Honolulu condo tower without making changes to the building’s glass curtain after deciding that it was a standard it could not defend. The state agency and the developer reached a $1 million settlement over the glass issue. 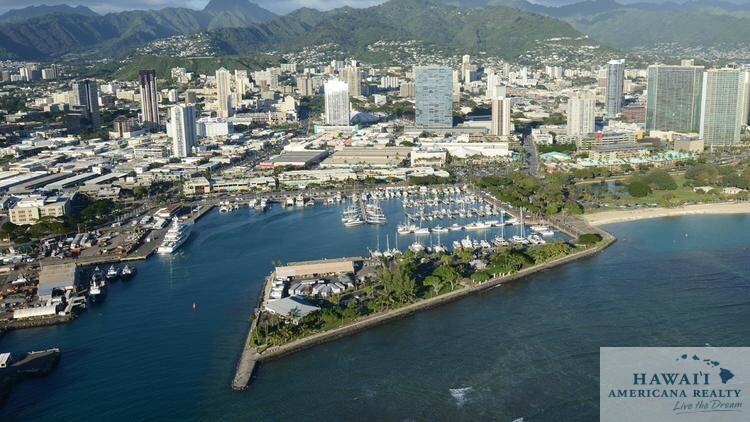 The Hawaii Community Development Authority has delayed making a decision on two separate proposals from two developers on renovations to the lands surrounding Kewalo Basin Harbor in the Honolulu neighborhood of Kakaako. At its regular meeting on Wednesday, which lasted until nearly 6 p.m., the state agency that regulates development in the area heard once again from The Howard Hughes Corp. (NYSE: HHC) and Kewalo Waterfront Partners, a partnership between two Japanese firms, and planned to make decision. But after heading into executive session, John Whalen, chairman of the HCDA board, said that the board needed more time to consider the two plans, and noted that some board members were not present to vote. The board plans to make a decision on what to do with the three parcels surrounding Kewalo Basin Harbor at its meeting on Dec. 2. The Howard Hughes Corp. has plans for all three parcels surrounding the harbor — the former McWayne Marine Supply site, the charter boat building site and the former National Oceanic and Atmospheric Administration lot. Kewalo Waterfront Partners, which includes Good Luck International Corp. and Hinamari Hawaii Inc., has plans to renovate four buildings totaling 45,000 square feet at the former McWayne Marine Supply site. Although Kewalo Waterfront Partners only submitted a plan for this site, it does plan to do small renovations at the other two lots. Its original plan that mostly remains the same for the former McWayne Marine Supply site, which is between Ala Moana Beach Park and Kewalo Basin Harbor, includes a permanent indoor farmer’s market, food halls, a chef’s club, a signature cafe, a beachside cafe, a multi-use venue that could host weddings, a live music venue, a sunset lounge, a public viewing dock, a lei stand, a community garden, a water feature and a parking structure. Kewalo Waterfront Partners, in its updated plan, broke the buildings down into five parcels, included a convenience store and refined the project’s architecture. Building heights also were lowered and more ground level parking was added. Ron Iwami, president of the community group Friends of Kewalos, spoke in opposition of Kewalo Waterfront Partners’ plan mainly because it is too dense. He said he prefers The Howard Hughes Corp.’s plan because it is less dense and said that the developer has been listening to his group from the start. The Kewalo Waterfront Partners’ project, over a 30-year span, would bring in more than $100 million in lease revenue, be responsible for $1 million in off-site infrastructure improvements, create 800 jobs and 250 parking stalls. 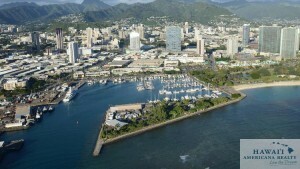 Howard Hughes, whose 60-acre Ward Village master-planned community is across the street and which manages the harbor, significantly scaled down its plans, including doing more landscape improvements and upgrades to the lot between Ala Moana Park and Kewalo Basin Harbor. At the charter boat building lot, the developer plans to add grab-and-go vendors that will provide items such as bottled water, sunscreen, slippers and towels, as well as a take-out lunch place. In former NOAA lot, the developer plans to pay homage to the “ice house” that was once located at the site and was used to supply ice to harbor-based fishing boats. The Kewalo Ice House would be transformed to include indoor-outdoor courtyards, bringing people together with shared interests in art, food, music and the ocean. In total, Howard Hughes lowered its project cost for improvements to the existing buildings and open spaces to $6 million, according to Race Randle, vice president of development for the Texas developer. Randle said the developer would like to renovate all three lots, and that whatever happens, the projects need to be holistically planned and implemented at one time because the lots surround a working harbor with many small businesses that need to be kept in mind as improvements are made to the surrounding lands. Dean Okimoto, owner of Nalo Farms in Windward Oahu, opposesthe Texas developer’s plan for the Kewalo Basin Harbor lands and is in favor of the Kewalo Waterfront Partners’ project because it supports local farmers. He raised concerns about The Howard Hughes Corp. already owning and operating the 60-acre Ward Village across the street, and that the developer would only be monopolizing the area even more if its proposals are chosen. The Hawaii Community Development Authority held its first public hearing Wednesday that addressed a glass rule issue at a second Kakaako condominium, which lasted nearly an hour with no questions from the board and no public testimony. The issue deals with the window glazing at Downtown Capital LLC’s completed 801 South St. “Tower A” workforce condominium in the growing Honolulu neighborhood. A spokeswoman for Downtown Capital told PBN that the 801 South St. Association of Apartment Owners, which now owns the tower, provided a resolution saying that the residents do not want to change the windows. 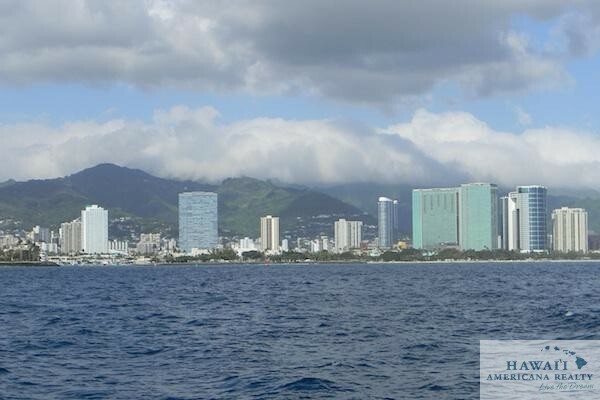 Shortly after receiving Downtown Capital’s petition, the state agency, which regulates development in Kakaako, issued a notice of violation to Downtown Capital regarding the glass rule. The rule also noted that on all other floors, the visible light transmission level shall be 50 percent or greater. The state agency is scheduled to hold a second public hearing on this issue on Thursday, starting at 9 a.m. The HCDA has scheduled a decision-making hearing for December 2 at 1 p.m.
All hearings are being held at the second floor of the HCDA offices at 547 Queen St. in Honolulu. Last month, the HCDA let San Diego-based developer OliverMcMillan proceed with its Symphony Honolulu condo tower without making changes to the building’s glass curtain after deciding that it was a standard it could not defend. 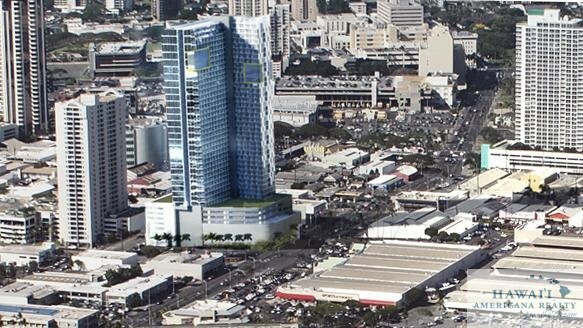 The Hawaii Community Development Authority on Wednesday delayed until next week making a decision on a “glass rule” for Kakaako high-rise projects regarding an issue with OliverMcMillan’s Symphony Honolulu mixed-use condominium tower. The board of the state agency regulating development in the Honolulu neighborhood was to vote on a decision at a meeting on Wednesday, but after a little more than an hour of deliberating in executive session, the board’s chair, John Whalen, said members needed more time to come to a decision. The HCDA decided to continue the hearing, which could include a decision on the glass rule, to Aug. 12 at 1 p.m.
Symphony Honolulu is currently being built at the corner of Ward Avenue and Kapiolani Boulevard across from the Neal S. Blaisdell Center, and is expected to be completed in less than a year. OliverMcMillan is requesting that the HCDA waive or permanently suspend the existing glass rule as it pertains to its Symphony project, as well as suspend the rule for Kakaako in general. The glass rule requires that current condo projects in Kakaako have a measured visible light transmission level of at least 50 percent. Symphony is being built with a visible light transmission level of less than 50 percent. The project’s development permit was approved for the current glass that is being installed, although the HCDA did not take into account the area’s glass rule. The San Diego-based developer said that the implementation of the glass rule has resulted in an unfortunate set of circumstances preventing development projects from satisfying HCDA-mandated minimum energy savings under the current set of rules. 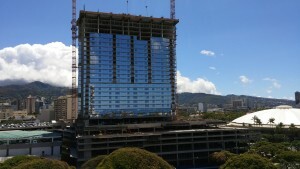 The developer also said that the glass rule makes it impossible for a project with a window-wall design, such as Symphony Honolulu, to meet both the glass rule and the required LEED minimum. Those who testified against the changing of the glass rule contend that it may set precedent for other developers, and that OliverMcMillan should have followed the rules. HONOLULU —The Symphony Honolulu highrise at the corner of Kapiolani and Ward is on track to open next spring. 90 percent of the units already sold. Crews have installed glass up on the 35th floor with just a few stories remaining. But as it turns out, the glass doesn’t meet the proper transparency standard set by the Hawaii Community Authority. It’s what engineers and architects refer to as VLT (Visual Light Transmission). The developer, Oliver McMillan, is hoping to get a waiver because it chose a darker, more reflective glass to keep the units cooler. “More privacy, better energy efficiency. Unfortunately, we can’t achieve that with glass that is 50 percent VLT or greater, so that’s why we chose the glass that we did,” said Oliver McMillan’s Dan Nishikawa. Some Kakaako residents don’t think HCDA should grant the waiver. They say all you have to do is look around. “We are building more buildings with glass surfaces, and the concentration of light will be much greater in certain areas of downtown. I think the heat index will rise to a point it will be uncomfortable for area residents and visitors,” said Kakaako resident John Kobelansky. HCDA said the whole idea behind the rule change was to avoid building more buildings with a ‘Darth Vader’ look. Staff maintains there isn’t a conflict in the new mauka area rules, but board members questioned whether there’s a standard for reflectivity since they were told less light streaming into an apartment unit doesn’t mean less light reflected out. In the case of the glass in the Symphony highrise, the mistake wasn’t caught until a competitor flagged it and HCDA checked. “It’s really important to understand how you are going to enforce it,especially when it’s something that is not being applied to other buildings outside of Kakaako, and this is something brand new,” said Board Chairman John Whalen. “If sustainability, energy efficiency is really important, we may want to take a look at reviewing the VLT and come up with a parameter that balances energy savings with other elements we are trying to achieve,” said HCDA’s Deepak Neupane. So, it could be back to the drawing board on the new glass rule. The HCDA is scheduled to make a decision on the Symphony high rise waiver on August 5th. The Hawaii Community Development Authority gave its final approval Wednesday on The Howard Hughes Corp.’s Kakaako residential project at 988 Halekauwila St. The Texas-based developer plans to start construction on the mostly affordable for-sale condominium tower across from Sports Authority by late 2016, according to its senior vice president of development, Nick Vanderboom. The project, which was originally approved by the HCDA as a for-sale development, was then proposed by the developer as a rental project. However, the HCDA board struck down that request and told Howard Hughes to stay with its original plan as a for-sale project. Its original permit includes building a tower with 424 for-sale units, including 375 reserved units. The project, which is being planned for the former site of the Kanpai Bar & Grill and Dixie Grill, and the current California Rock ‘N Sushi, is part of The Howard Hughes Corp.’s first phase of its 60-acre Ward Village master plan. Under the current rules, Howard Hughes can’t move people into its Waiea and Anaha luxury condos, which are also part of phase one, until it puts financial assurance that it will build 988 Halekauwila, or starts construction on the project. The Honolulu neighborhood of Kakaako — one of the communities that’s a part of the city’s transit-oriented development plan — could be getting a limited number of hotels and a maximum of three high-rise residential condominiums with heights up to 700-feet, according to public documents. 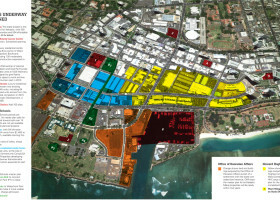 The Hawaii Community Development Authority, the state agency regulating development of Kakaako, released its final environmental impact statement for the area’s transit-oriented development overlay plan. Among other things, the plan identifies specific properties for public/private development partnerships, allows and promotes a mix of building types, increases opportunities for both affordable housing and for overall development capacity while reducing parking requirements. The plan also promotes transit-friendly and community-supportive land uses to encourage “around the clock” activity in and near transit stations, establishes an incentive program to trade developers higher capacity and taller buildings in exchange for providing more open space, and provides landscaped “green connections” and mid-block paths when parcels are consolidated for redevelopment. Another aspect of the plan includes increasing the maximum allowable building height on a limited number of properties to encourage the development of signature buildings that could contribute to the area’s identity. The 1,259-page final EIS said that the overall goal of transit-oriented development is to achieve the quality of life improvements associated with well-planned, in-town densification tied to transit accessibility, non-vehicular infrastructure improvements and access to a broad mix of uses, amenities and services. To implement these goals, transit-oriented development’s guiding principles rely on six “D’s” of transit-oriented, pedestrian-focused community planning, including destinations, distance, design, density, diversity and demand management. The Hawaii agency charged with overseeing the redevelopment of the Honolulu neighborhood of Kakaako has shelved a proposal that would have created an economic accelerator in the former World Gym building on Queen Street. At a Thursday special meeting, the Hawaii Community Development Authority denied the authorization of a memorandum of understanding for the project, which included the state agency paying for the lease for two years on behalf of the operator of the economic accelerator. But at least one board member, Vice Chair Steven Scott, raised concerns over the HCDA paying up to $300,000 in rent over two years for the project without getting a return on its upfront payment. Karl Fooks, president of the Hawaii Strategic Development Corp., which was spearheading the project along with three other state agencies, including the HCDA, said that tenants would be responsible for the rent after those two years. The HSDC promotes economic development and diversification in the state through a return-driven investment program in partnership with private capital. Charles Wang, an entrepreneur who was a founder of RevoluSun and is now the CEO of EcoQoob, an energy audit startup, said that the economic accelerator would help attract more entrepreneurs like himself to the area. Luis Salaveria, director of the state Department of Business, Economic Development and Tourism, noted that the venture could have highlighted collaboration of state agencies that his department oversees. In addition to the HCDA and HSDC, the other agencies involved include the High Technology Development Corp. and the Hawaii Housing and Finance & Development Corp., which is the landlord for the former World Gym building at 1050 Queen St., across from Ward Village. The economic accelerator, which was first reported by PBN, would have allowed some of its startups to be able to transition to the commercial pipeline being developed in Kakaako. The Howard Hughes Corp. has changed its plans for a Kakaako residential project back to a mostly affordable for-sale condominium tower after requesting a Hawaii agency approve the project as a rental development, an executive from the Texas-based developer confirmed to PBN Thursday. The HCDA originally approved the developer’s 988 Halekauwila St. project, which will be built across from Sports Authority on Ward Avenue, as a for-sale development. However, earlier this year, Howard Hughes Corp. filed a request with the HCDA to change the Ward Village project to a rental development. Last month, the state agency, which regulates development in the Honolulu neighborhood, struck down the developer’s request, but a final decision isn’t expected until next month. The HCDA board took up the issue this week, but after receiving the new proposal to switch the project back to a for-sale project decided to reconvene on July 22 to discuss the project further. The project, which is being planned for the current 404 Ward Ave., the former site of the Kanpai Bar & Grill and Dixie Grill, and the current California Rock ‘N Sushi, is part of The Howard Hughes Corp.’s first phase of its 60-acre Ward Village master plan. WARD VILLAGE by Howard Hughes Corp.
Hughes AE’O at 1001 Queen St.
For the past 14 years, Mark G. Howard has practiced his skills as a licensed Realtor in Santa Fe, New Mexico, Las Vegas, Nevada and now Principal Broker & President of 'Hawaii Americana Realty', in Honolulu, Hawaii. He has gained a competitive edge in the real estate market by earning his status as an Accredited Buyer’s Representative (ABR). Company Disclaimer: Information is deemed reliable but not guaranteed.